Concussions are no fun. I have suffered at least 3 concussions in my life. When I was younger, at a public skate I was racing a friend and slipped and fell into the rink boards head first. Back then, helmets weren’t required. The 2nd one was from a hockey hit during my teenage years. The 3rd and most recent was in adulthood. I was chasing my nephew at a local park at dusk. I ran up the slide after him and went forehead first into the metal cross bar that I didn’t see. Ouch! I had symptoms for 4 months. Fatigue, dizziness, neck pain and headaches. Frustrating to say the least. What were the things I did to help myself heal? Rest, limit screen time, limit any intense exercise, good nutrition, lots of water intake, and getting chiropractic adjustments. 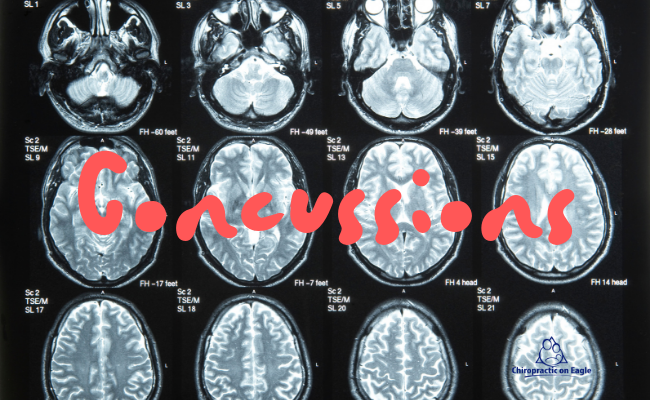 I have seen many patients with post-concussion syndrome and to say most patients are frustrated with their recovery would be an understatement. The good news is there are many things someone can do to help with their recovery. It is important to get diagnosed correctly if you have hit your head, had whiplash, or trauma (like a fall) and experience any of the above signs or symptoms. Please see your health provider or go to the emergency department immediately. Often when there is trauma to the head or neck, and a concussion has been diagnosed, there may be some help available from your chiropractor in addition to other treatments you may be receiving. The neck can often be injured when a concussion has happened. A neck injury, for example whiplash, could be causing some of the related neck pain and headaches associated with concussions. A thorough chiropractic exam would help to determine if someone suffering from post-concussion syndrome may be helped. Tight muscles and neck alignment issues, if found, can be helped. It is worth exploring! There are many available modalities to help you in your recovery. One thing is certain, managing your concussion requires a team approach. Chiropractic care may just what the doctor ordered.